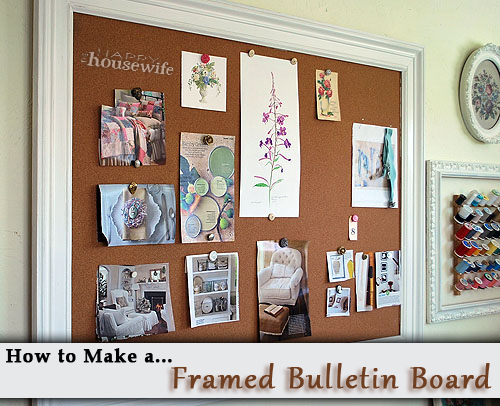 I love the framed corkboards from Ballard Designs – especially the largest sizes. 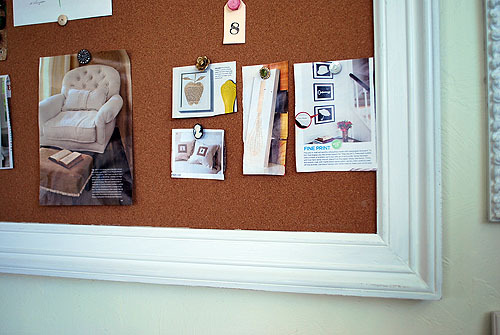 Unfortunately, the price causes me to hyperventilate so I’ve looked for ways to make my own DIY framed bulletin board. I’ve been able to make smaller boards for my kids using rolled cork applied messily to foam board, but I’ve been limited by the dimensions of the rolled cork. 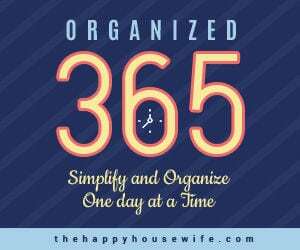 Then one day I spotted a 36-inch by 48-inch corkboard (the kind found in offices with a metal border) in a discount store for $8.99! I brought it home without the faintest idea how we would apply a wood frame, but with complete faith in my husband (*wink*). After finding some wide, used molding at a local salvage store ($10 for all four lengths), we put our heads together and came up with an easy way to attach wood molding to a pre-made corkboard. 1. Carefully measure the dimensions of your cork board. Then mark your molding pieces for cutting so that the board will rest inside the “frame” you’re making–like the cardboard back on a picture frame. 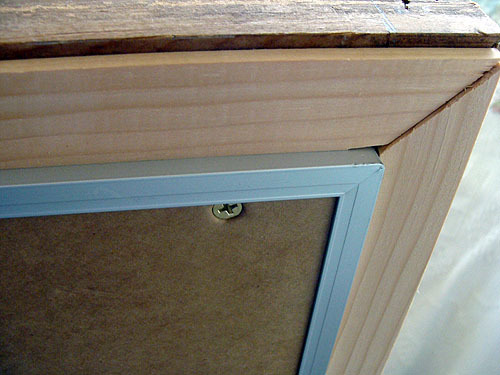 It should overlap 1 – 2 inches to give you room to screw through the edge of the corkboard into the wood frame (we made a pencil mark where the edge of the board hit the molding and used that to guide us in cutting the mitered corners). 2. 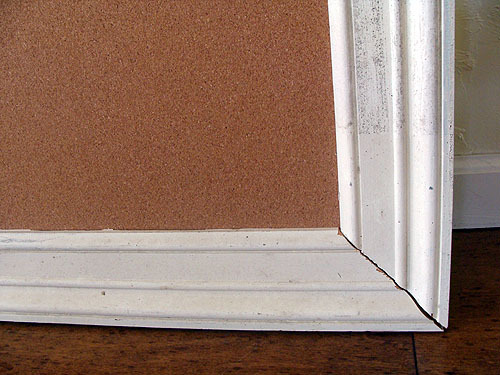 Using a miter saw or box, cut the molding to the dimensions of the cork board. If you’re using the optional lath strips to hide some of the metal frame, cut these at the same time as well. As you can see, the corners aren’t perfect, but nobody will see this part and the front can be easily fixed with wood filler – so don’t be afraid of the mitered cuts! 3. Paint the frame molding at this point, if needed. If you’re starting with new wood, use a primer and then a couple coats of paint. The salvaged wood we found was already painted white, so I only added a light coat at the end. 4. 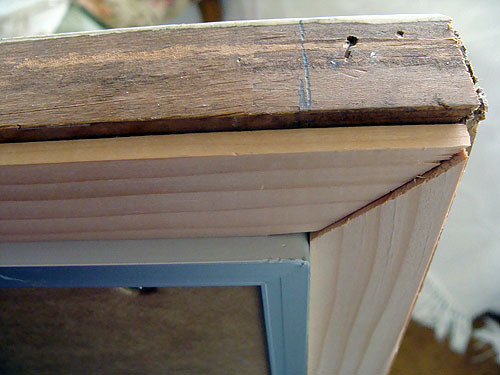 Match the corners of your wood frame together and attach them by nailing the finish nails from the side. 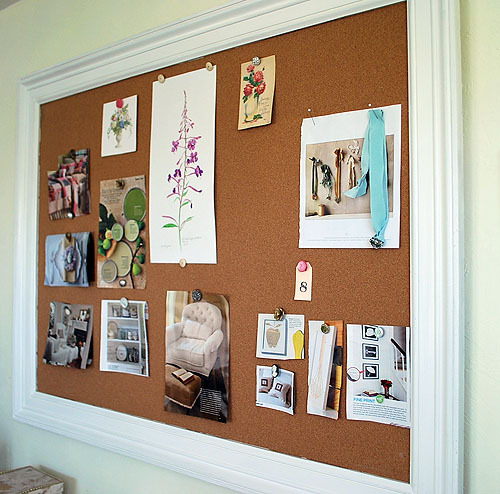 Lay the wood frame face-down and set your cork board in place. 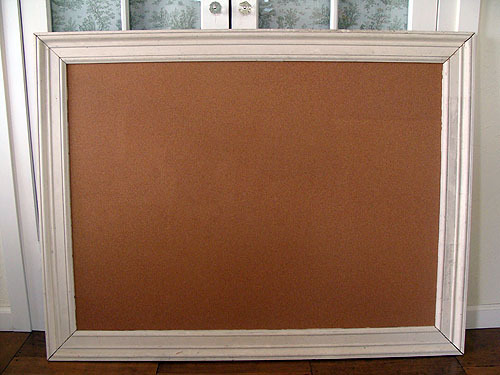 Using a drill or power screwdriver, drive the screws through the back of the corkboard and into the wood frame. Make sure they are going into the thick part of the wood molding. 5. 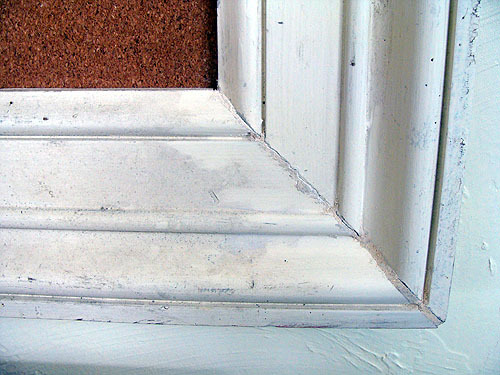 If using the lath strips, apply them with the board lying face down and run a bead of wood-glue to each, placing them next to the edge of the metal frame on the back of the wide molding. All that’s left is to fill any corner gaps, paint and hang. If you’re an ace with a miter saw, you might not even need to do this! 6. Fill the mitered corners, where needed, with the wood filler, smoothing with your finger. Allow to dry and lightly sand the filled areas. 7. After a bit of touch-up painting on the corners, no one will be the wiser to the less-than-perfect miter job. 8. Lastly, hang using the hardware provided with the cork board. Alternately, attach it directly to the wall if you’ll never want to move it. 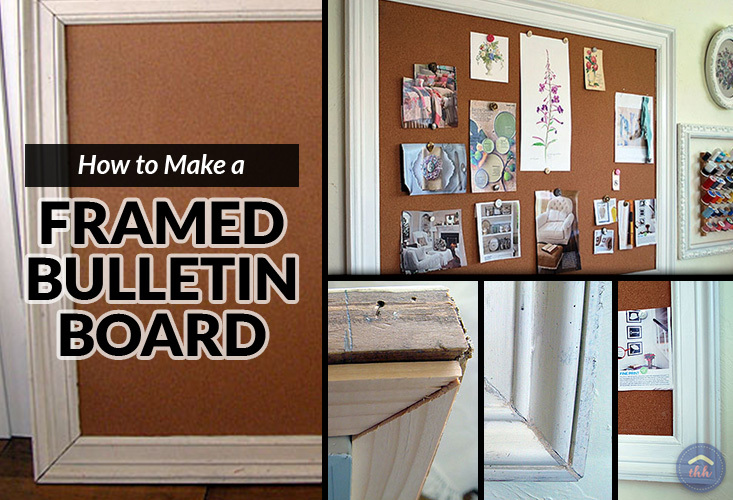 Nail directly through the molding that is on the top of the cork board, fill the holes and paint. All that’s left is to fill it with all the things that inspire you. I don’t know what I’m more inspired by! My clippings and photos, or the fact that this $300.00 DIY framed bulletin board knock-off cost us just over $20.oo. What do you think? Awesome! Yes, Ballard designs has beautiful items but the prices are insane. Looks great! I love it. I think it turned out really great. Looks like a million bucks! The tutorial was good too. 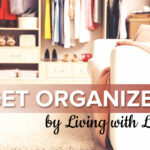 I saw that you’ve done some guest spots (on your blog you mentioned it) thanks for mentioning this, so I could jump over and read all about it. I think its great … well done! Would look wonderful is most homes … love the white frame very cool indeed.